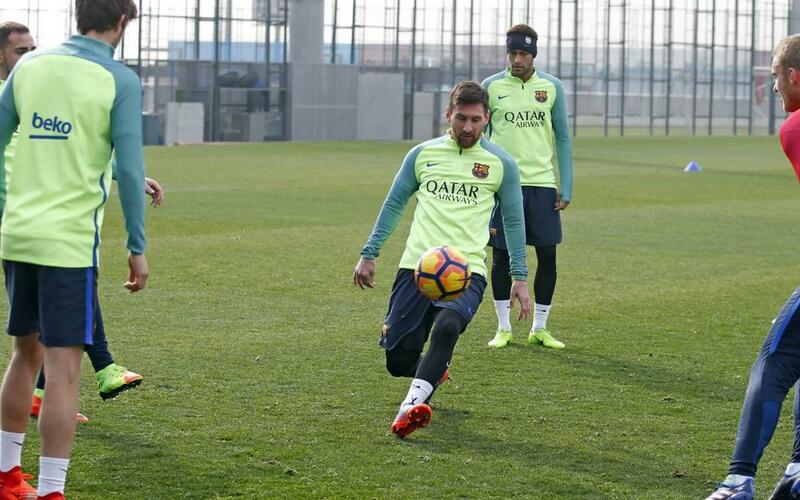 Following the 2-1 win away to Atlético, Barça went straight back to the training ground on Thursday morning to start preparing for the next challenge – Saturday’s Liga match against Athletic Club (4.15pm CET). The mood was naturally buoyant following events at the Vicente Calderón the night before, but there was an added reason for cheer at the Ciutat Esportiva with Gerard Piqué celebrating his 30th birthday. And the smiles didn’t stop there, because there was further good news when Andrés Iniesta took to the field. The first team captain is well on the road to recovery from the left soleus injury that he picked up against Real Sociedad and was able to join his colleagues for today’s workout. The first team players went through the usual post-match recovery routine, while Mujica, Marlon and Aleñá of Barça B joined the rest of the first team squad for the normal round of exercises. The team has time for just one more training session before the game with the Basques and that will be on Friday at the same time of 11.00am CET, to be followed by a Luis Enrique press conference.